Galactic Marathon: A course of unknown length generated by the contestants' wristbands stretching between "Starting Line World" and "Finishing Line World"
(Quasar#58 (fb)) - "Millennia" before the Galactic Marathon, the Elder of the Universe known as The Runner had visited the planet Grosgumbeek, leaving its speedy inhabitants a teleportation box, which would take their chosen champion to the "Starting Line World" when the Marathon was about to commence. No Grosgumbeekians accepted the offer, as they disdain competition. (Quasar#17) - The Runner contacted a number of Earth's super-speedsters to engage in a race from Earth to the moon, in order to determine which was worthy to accompany him to the Galactic Marathon. 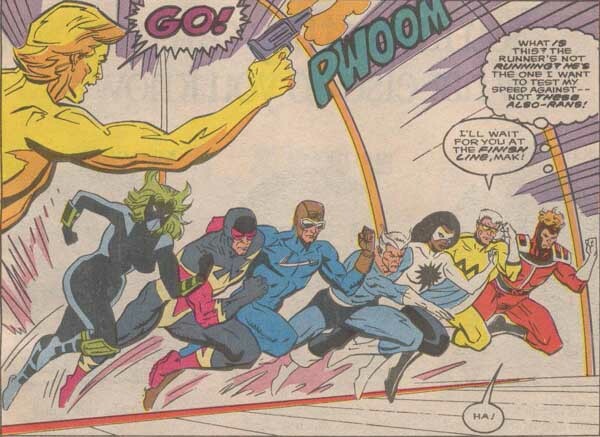 Black Racer, Captain Marvel (Monica Rambeau), Makkari, Quicksilver, Speed Demon, Super Sabre and the Whizzer were chosen for the qualifying run. The competitors raced a stretch of track constructed by the Elder known as the Architect, which traversed the 384,392 kilometers from Earth to the moon, with "a short detour through warp space" to "take in account the motions of the heavenly bodies". Makkari quickly out-paced the other competitors, but was defeated when a mysterious man calling himself "Buried Alien" appeared on the track and ran to victory. Despite the fact "Buried Alien" had not started at the same point as the others, he was hailed as the winner by Runner, and accepted into the Galactic Marathon. Makkari fell to tears at his loss, but was consoled by Quasar, who told him he was still the fastest man on Earth, as "Buried Alien" was not from Earth (at least, not from Earth-616). 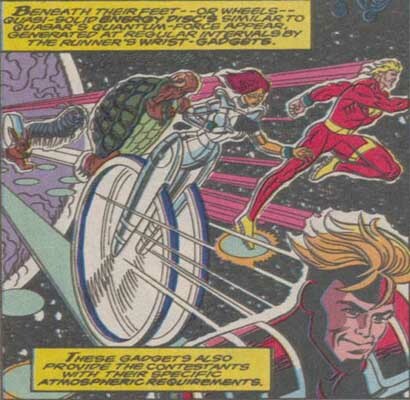 (Quasar#58) - Numerous contestants were gathered by the Runner from various points in the Milky Way galaxy and taken to the "Starting Line World" for further training. After an unrevealed period of time, everything was readied and the race was about to begin. Shortly before the race began, however, Makkari, who had been training on Grosgumbeek, arrived via the Grosgumbeekian teleporter box, and begged Runner for another chance to qualify. Runner acquiesced, and stated that if Makkari could beat the time of the slowest competitor, the Fomalhauti Figillulli, he could run. The Eternal easily beat Figillulli's time, and the unlucky Fomalhauti was sent away in tears. The Galactic Marathon began, and the racers took off at incredible speeds. 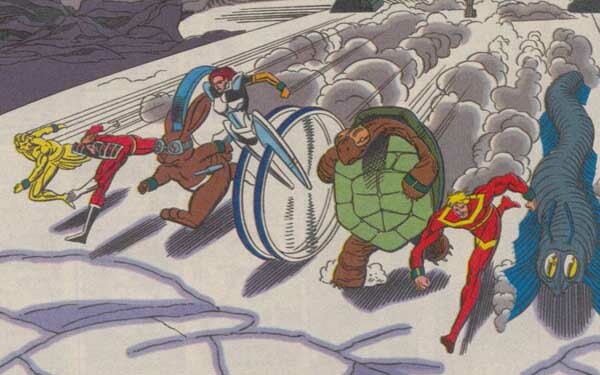 One of the racers, however, the sinister Fooferah, decided to cheat, first taking out the centipede-like Miximixum's legs with a baton, next striking the turtle-like Gzoom with a stun-drum, and then sticking another baton into the cyborg "Wheelie's" spokes, causing "Major Skiddage!" as Fooferah put it. With only Makkari, Runner, and Fastforward ("Buried Alien's" new name) left in the race, Fooferah threw his stun drum at Makkari's head, but Fastforward intercepted the weapon, turned around and beat Fooferah senseless, leaving the Marathon to Makkari and The Runner. To Runner's surprise, Makkari reached even greater speed than the Elder himself, and won the Galactic Marathon by a wide lead. After accepting the Champion's Medallion from the Galactic Roadrunner, Makkari returned to Earth to brag to his friends, but found himself unable to communicate with anyone: Everyone seemed to be standing still. Returning to "Finishing Line World," Makkari found the Judicator and others frozen as well, and was informed by Runner that he had become trapped in Absolute Speed, his mental processes and perceptions being set at Hyperspeed: he was simply moving too fast to communicate with anyone except the superfast. The Grandmaster, smarting from having lost a bundle he'd bet on Runner, offered to help Makkari, in exchange for Makkari becoming his "champion" in the other upcoming Galactic Marathons, the Local Pangalactic Marathon, and finally the race for the championship of all known space. Makkari refused, leaving the jubilant Runner as Grandmaster's champion. As Fooferah had cheated, the judges threw out the ruling, and Runner was eager to race against Makkari again, but Makkari and Fastforward left to try to find a "cure" for the Eternal's accelerated speed trap. As they left, Runner started throwing a childish tantrum, refusing to accept the fact that he wouldn't have the chance to defeat Makkari (or try to, anyway). Comments: Created by Mark Gruenwald, Peter Sanderson, Mike Manley, John Heebrink, Paul Becton, and Aaron McClellan. It is unknown who competed in the re-match caused by Fooferah's cheating, but without Makkari and Fastforward, Runner almost certainly won, though I doubt he enjoyed it; he wanted to prove himself against Makkari. I hope poor Figillulli got to run, (or slither), this time around. There are many galaxies, thus many Galactic Marathons, The Local Pangalactic Marathon would likely encompass champions from all galaxies within a chosen area of space. The Grandmaster stated that the race for the championship of all known space (the Universal Marathon?) would take place approximately three thousand years from this specific Galactic Marathon. Grandmaster does not possess hyperspeed, but he does have some control over time and space, which is how he was able to communicate with Makkari in his accelerated state. Any other races or contests held by any Elders of The Universe, or anyone else.